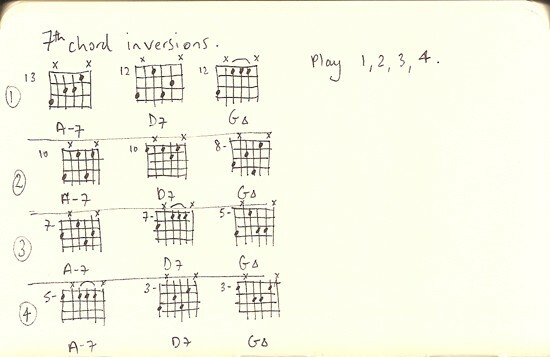 Here are all the 7th chord inversions using these here voicings on strings 6432 for a II V I progression in G major. Learn it in this order: 1, 2, 3, 4, so you’ll be working your way down the neck. Pay attention to each voice on each string. Focus on the B string and follow what happens to the line all the way down. What are the functions of the notes? Can you omit the notes on the B string and sing the missing notes? Can you play the chords finger-style and bring out that string so it’s louder than the others? Can you do all of that for every string? Apply these voicings to a tune with a good chord progression such as All The Things You Are, or Stella. Stick to these voicing types; you should learn how to change them to other chord types: -7b5, -7#5, 7b5, 7#5, ∆b5, ∆#5, ˚7, -(∆), and so on. Can you get it so that you can play any tune and you know you’ll be able to use these voicings no problem?